• It's been some time since president/basketball operations Neil Olshey has taken his customary seat alongside owner Paul Allen under the basket near the Blazers bench during games at Moda Center. The last time may have been Oct. 29, when the executive delivered a single-finger salute to someone associated with the Los Angeles Clippers — the intended recipient never has been officially revealed — from the seat after a 104-103 loss to the Clippers. Olshey was issued a warning from the league office after the incident, which was caught on video. Team officials deny Olshey is under any punishment. Maybe he just found a better seat. • It was good to see the Brooklyn Nets honor the memory of the late Drazen Petrovic, 25 years after the Yugoslavian guard died in an auto accident at age 28. The 6-5 shooting guard blossomed with the New Jersey Nets through 2 1/2 seasons after a trade from the Trail Blazers in 1991, earning third-team all-NBA honors while averaging 22.3 points in 1992-93. That summer, he died. Before that, Petrovic spent 1 1/2 seasons with Portland during a time when Clyde Drexler was starting at his position for the Blazers. As a 25-year-old rookie, "Petro" averaged 7.6 points and shot .459 from 3-point range while playing only 12.6 minutes per game. He had good moments in the playoffs, too, as Portland reached the NBA Finals before losing in five games to Detroit's Bad Boys. The second season, Danny Ainge was added to the mix. Petro's playing time dropped, and it wasn't enough for the gym rat who had been a star in Europe and lived to play basketball. He asked for a trade and was sent to New Jersey in a three-team deal that yielded veteran Walter Davis from Denver. Davis, then 36, played only OK for Portland, averaging 6.1 points in 13.7 minutes the rest of the regular season. Then he returned to the Nuggets for his final NBA season. It was a very bad deal for the Blazers. Petro, meanwhile, made the most of his chance in the limelight with the Nets under coach Chuck Daly. It would have been fun to see how he fared through a long career in the NBA. I got to know Drazen well through his time with the Blazers. Loved the guy. He had an engaging personality, offered a ready smile, and would have been a player with whom the fans identified had he stayed here. He could shoot and score from anywhere. Can't believe he's been gone now for a quarter-century. • The Sacramento Kings announced last week they will submit a bid for the 2022 or '23 NBA All-Star games, the next available years (it's in Charlotte next year, Chicago 2020, Indianapolis 2021). Portland president/CEO Chris McGowan assures that the Blazers are bidding "aggressively" for any available All-Star games, too, though they have been turned down in recent years. I'll reiterate what I've written several times over the years — the league owes Portland one. In the late '80s, Portland was granted an All-Star Game. No records exist as to what year, but it happened. Then the league rescinded its offer, deciding to alternate the game between a few major markets. After a couple of years, the league changed its mind again, opting to move the game around. And somehow, Portland got left out in the cold. The league's excuse for not having the All-Star Game in Portland has mostly been lack of a headquarters hotel and general hotel space near the arena. To that, I offer: Surely you jest, especially with a 600-room Hyatt Regency being built adjacent to the convention center. I hope McGowan steps up the offensive, although it may be team officials would just as soon the game not be held here. It's a lot of work for minimal rewards. But it's a nice feather in the cap for the city, which deserves a nod for perennially having one of the best fan bases in the league. • For years, through his time as head coach with the Suns, Knicks and Lakers, we heard about how Mike D'Antoni was an outstanding offensive mind but couldn't coach defense, which meant he would never run a championship-caliber operation. Now the former Blazer assistant coach has the NBA's best record with the Houston Rockets, who play great offense but also sufficient defense. "Not really," he told me recently. "People put labels on a lot of things. You coach the personnel you have, and you maximize whatever you've got. We have a lot of guys (with the Rockets) who can play defense. Lo and behold, it works. "To me, that's what it is. There are a bunch of coaches who are labeled. I'm not a big believer in all the labels. If you can coach, you can coach, whether it's defense or offense. It's basketball." • "Tanking" has been a hot topic in NBA circles over the past week. As in, a team out of the playoff picture and headed for the draft lottery "resting" regulars and playing its young players under the auspices of "player development." In so doing, those teams will lose more games and position themselves for a better draft pick. 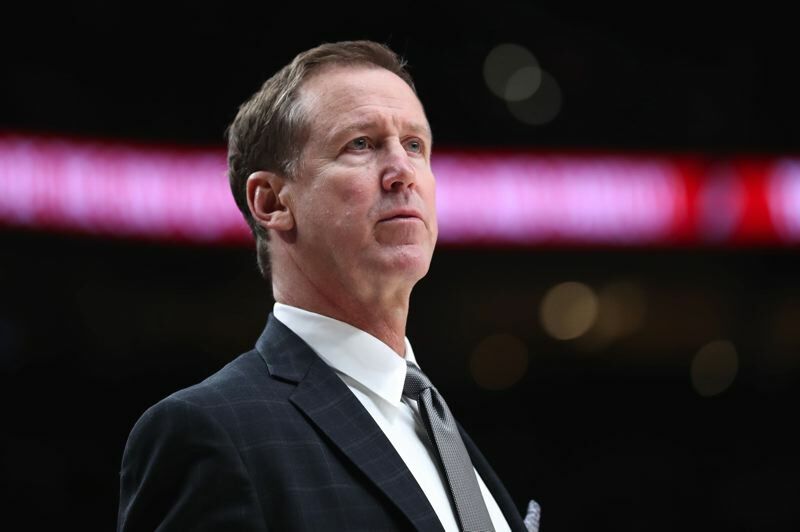 "I don't use that term," Portland coach Terry Stotts said when asked about it recently. "Each team is doing what's in the best interest of their franchise. For teams that are out of the playoff race, it's an opportunity to play their young guys, to put (veteran) guys in position to not be injured. "My first year here (2012-13), we lost our last 13 games. We were trying to win every one of those games, but we were playing young guys and giving them an opportunity to play. I wouldn't have used that term for us then, and I don't use it for other teams now." The problem is, other teams are affected by a "tanking" team's outcome. "There's an effect," Stotts conceded, "but the more important thing is ... teams are playing their young guys, and they're learning to compete at an NBA level. It's going to help them down the line." There's a misconception about "tanking." I would never suggest the coaches and players who are on the court aren't trying to win. It's in their competitive nature. Besides that, players are playing for paychecks and more playing time in the future, so they're not going to play poorly on purpose. But when you're not putting your best team on the floor — and this is something San Antonio's Gregg Popovich does routinely with his veteran group through a season — your chances of losing are greater, which affects the playoff chances of other teams. And that is not a good or fair thing. Memphis has lost 11 in a row, and I like what veteran center Marc Gasol said about the subject recently. "It's not about somebody playing well or getting your reps or developing players," Gasol said. "We have a league for that … this is the NBA, not the G League." • Minnesota Timberwolves coach Tom Thibodeau tries to borrow ideas not only from other NBA coaches, but those he admires from other sports, including Bill Belichick of the New England Patriots and Hall of Fame baseball manager Tony LaRussa. "I grew up a Patriots fan in Connecticut," Thibodeau said during a recent stop in Portland. "When I was in Boston (as an assistant coach from 2007-10), I had an opportunity to watch them very closely. I had the good fortune to watch them practice and to visit with (Belichick). His record speaks for itself. He's one of the all-time greats, if not the greatest. What he has done is simply amazing, and as a New Englander, I don't take that for granted. I appreciate every moment. "Bill is very close to LaRussa. I've spent time with Tony as well. The day we spent together was mostly talking about what wins. It's really the same in all sports. First, you eliminate the ways you beat yourself. You build your base with your fundamentals. You have to have conditioning and discipline and all those things that matter." Thibodeau said he always studies coaches "who have done great things," name-dropping Popovich, Mike Krzyzewski and Jim Boeheim as men he has spent time with talking about the profession. "You learn from guys who are able do it from year to year for a period of time," Thibodeau said. "That's the mark of greatness. To be truly great, you have to do it year after year." Thibodeau's first NBA coaching job was under a former Blazer assistant, the late Bill Musselman, with the Timberwolves from 1989-91. "After that first practice, I was truly amazed at what I saw. We became friends. I went to as many of his practices as I could, and I learned a ton. For a guy coming in from college to get the opportunity to work for him was great. There's such a big difference between the college and pro games. It was hard work, but it was the best way to learn the NBA."